Sherlock is not particularly good TV. It’s entertaining TV, and it’s frequently endearing TV, but its strengths have never conformed to the current metric for evaluating good, or rather, “prestige” TV—a term so misused, it no longer simply applies to series that are successful in their ambitions to be formally and thematically complex, but to any TV show with the vague sheen of high-budget production design and needlessly shocking plot twists dressed up to seem more novel than they actually are. Post-“Reichenbach” Sherlock also saw the introduction of Mary Watson, neé Morstan (Amanda Abbington), a character that in some ways, along with Moriarty’s recurring antagonism, became the face of this new mythology-building mode of the show. Last season’s reveal, that Mary was formerly part of an elite group of assassins-for-hire, was a twist so needlessly convoluted, it made the finale’s tease that Moriarty may still be alive seem plausible. As Mycroft (Gatiss) and his committee debrief his brother on the terms of his release (all footage of Magnussen’s death has been doctored to appear to be the work of a sniper, thus exonerating Sherlock, though why Mycroft didn’t pull these Photoshop strings sooner is not addressed), Sherlock is elated. The game is once again afoot, and Sherlock’s newfound joie de vivre has him obsessively tweeting out cheeky hashtags (#221BringIt doubling as a BBC marketing strategy for the show’s return) and bantering with the committee’s elderly secretary. Jazzed with the thought of solving Moriarty’s “posthumous game,” Sherlock throws himself into his work, tearing through minor case after minor case with Mary and John in the hopes that some sort of discernable pattern, some tiny clue to Moriarty’s scheme will reveal itself. The cracking mysteries that used to take up the entirely of a Sherlock episode are summarily solved in the first act—until one particular case, in which the son of a rich couple turns up dead in their driveway, leads into a bigger conspiracy involving a series of six plaster busts of former Prime Minister Margaret Thatcher (Sherlock, stalling for time, feigns ignorance: “The first female prime minister of the country.” “Right. Prime minister?” “The leader of the government.” “Right. Female?”). 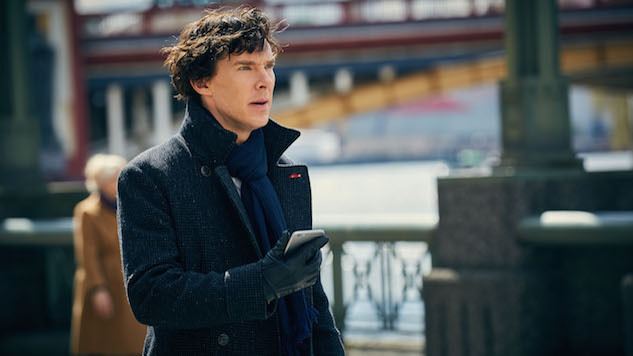 Sherlock discovers there has been a rash of break-ins at the residences of those who own plaster Thatchers, with the bust ending up smashed to bits in each incident. Initially deducing the Six Thatchers conspiracy to be Moriarty’s plot, one of busts turns out to be the hiding spot for a duplicate of the memory stick Mary gave to John last season, which contained files detailing her former career as an assassin. It turns out the perpetrator of the robberies is one of Mary’s former associates, hell-bent on killing Mary in retaliation for an event that occurred in Tbilisi, Georgia six years prior, which he believes was the result of her betrayal of their team. The final fallout of the “Mary is a secret agent” story turns out to be a plot device that seems like it will be a fulcrum of the rest of the season: the break-up of John and Sherlock. Mary, ostensibly paying him back for having to shoot him last season, jumps in front of a bullet meant for Sherlock (it turns out the Georgian betrayal was the act of the elderly receptionist from the first act, and she would have gotten away with it, too, had it not been for that meddling consulting detective). John lashes out at Sherlock for his culpability in Mary’s death—and likely acting on feelings of guilt, for moments before he seemed about to confess to having had an affair (whether physical and/or emotional is not made clear) with a woman he encountered on the city bus. It’s an odd little subplot that will likely crop up in future episodes, to either complicate John’s “good man” persona or to introduce a new female character after so quickly dispatching the last. And there lies one of the problems with post-”Reichenbach” Sherlock. In expanding the world of the show, the series has strayed farther away from what made it so compelling in the first place. Sherlock and John’s interactions are pushed to the margins of “The Six Thatchers” to make room for Mary’s expanded role. Incidentally, any progressiveness gained from adapting what is traditionally a passive female character into a woman of action as Sherlock did with Mary is immediately undone by killing her off to further the male character’s stories. The episode ends with Sherlock in therapy, but Sherlock itself is in need of a bit of critical self-reflection. Mallory Andrews is a senior editor for cléo, an online journal of film and feminism. She is a bi-weekly columnist for Movie Mezzanine, and has also contributed to The Dissolve, Indiewire, Cinema Scope and Esquire.